Arthur Jeffes is a musician, composer, producer and founder of Penguin Cafe. Before settling down to make music he studied archaeology at Cambridge University and dabbled in Arctic exploring, which became the starting point for Arthur to become a composer in his own right, as the prolonged periods of icey silence inspired original compositions. 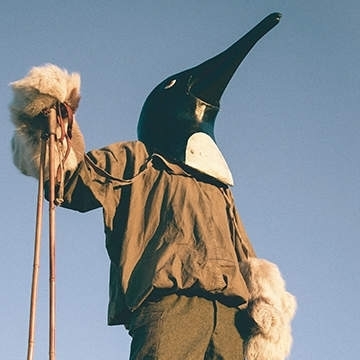 Following in the footsteps of his father, Simon Jeffes of the iconic Penguin Cafe Orchestra, Arthur formed Penguin Cafe with a brand-new line-up, including Cass Browne of Gorillaz, Neil Codling of Suede, Oli Langford of Florence and the Machine and Darren Berry of Razorlight. Penguin Cafe’s music bears all the hallmarks of PCO that its disciples will know and love, continuing to transcend popular and classical music. Three albums followed: A Matter of Life… in 2008, The Red Book in 2014 and The Imperfect Sea — released on Erased Tapes in 2017. The same year Arthur paid tribute to his late father by performing PCO’s seminal record Union Cafe live to a sold out Union Chapel, coinciding with the album’s re-issue on Erased Tapes. 2018 saw the Penguins perform in Paris, Berlin and London with a special show to support Greenpeace at the new venue EartH in Hackney. Arthur and his group are back in the studio creating their forthcoming fifth studio album, due for release in later 2019.